I recently read a short booklet written by art critic and curator ERIC TRONCY that has been released on the occasion of the group exhibition he curated in the late nineties. Entitled Dramatically Different: Le spectateur dans l’exposition, TRONCY shared insightful thoughts about exhibition watching and curating while describing the exhibition he not only did but also visited. In my quest to find excerpts of this book, I stumbled upon this interview he did with OLIVIER ZAHM for Purple Magazine #24 in 2015. In the middle of the conversation, TRONCY discussed about Frog, an art and architecture magazine he published twice a year. 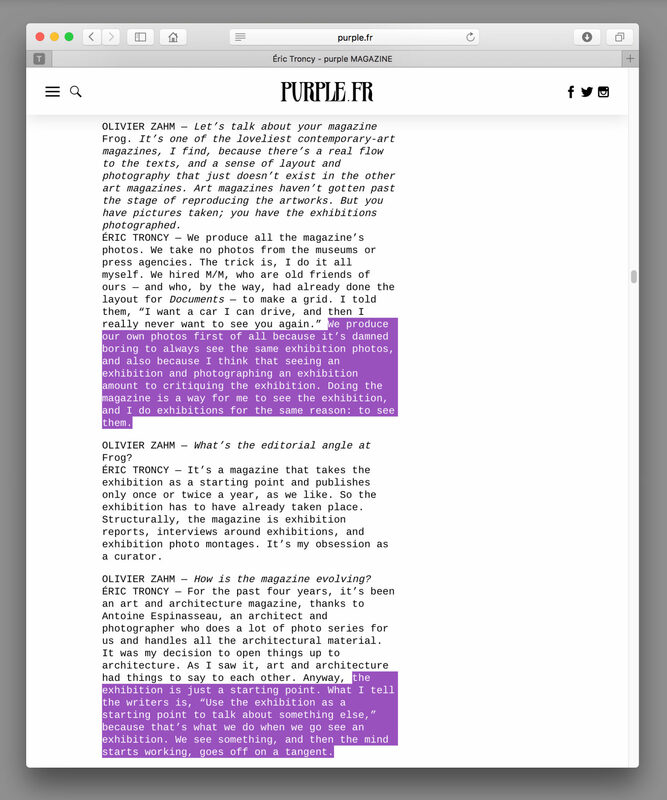 I really suggest you to read the entire Purple interview here. I also recommend you this book that documents Dramatically Different (Le Magasin, Grenoble, 1997), Weather Everything (Leipzig Museum, 1998), and Coollustre (Collection Lambert, Avignon, 2003), three group exhibitions curated by ERIC TRONCY.